As the sun shone on Sunday, a herd of runners pounded past me on the Heath. Mens sana in corpore sano, a healthy mind in a healthy body is promoted to the top of the agenda in the new year. If a luxury boot camp (here are Lonely planet’s top picks) is a step too far, then there are plenty of ways available to reboot and reinvigorate mind, body and soul closer to home. Don’t fall into the trap of signing up to annual gym membership, the National Trust’s website has plenty of advice for the outdoor gym, (see picture). There are tips to get you started, videos and a 31 day plan. Not only is the outdoor gym free, but you’re more than likely to get a healthy glow from vitamin D, work harder on uneven natural surfaces, and burn 20percent more calories as a result. Healthy body on the outside generally follows a healthy body on the inside, so have a look at the Eden Project’s list of ‘Seven foods to help fight those January blues’. 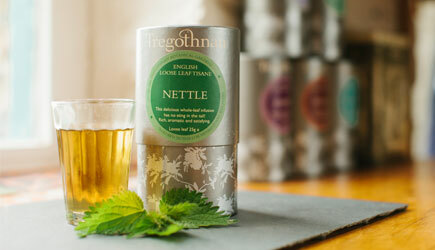 Drink nettle tea (pictured), which is surprisingly refreshing, if slightly grassy, and eat all the colours of a rainbow. If you need a little inspiration on how to prepare your super foods, or enliven your diet, try a raw food course at Nama Foods. At the end of the month they are running a fermentation workshop, not beer but sparkling drinks for all the family. Detoxing is more than a physiological process, it is also a mental one. Detoxification is letting go of the old, and releasing what no longer serves you, whether clutter in your home or patterns of behaviour. Clearing away the old stories to make way for the new. What will be the your inspiration? A new skill? All around the country the National Trust runs a wide range of courses and workshops from hedge laying and drystone walling, to photography and painting. Check the events pages at your local museum or craft centre. In London, the Victoria and Albert Museum run a varied mix of workshops, or try Kew Gardens for a one day course to grow orchids successfully at home and bring a bit of tropical colour indoors. You could refresh a room at home. Elizabeth Cake, author of ‘Make Your Own Lampshades’, runs workshops to make lampshades (the next is with the How to Academy on 4th February). A screen print made at a workshop with the Print Club London to frame your new year’s manifesto? Take it further and hand print your own wallpaper at the Papered Parlour later this month. Or learn about furniture restoration, reupholstery or repainting, with Goodlife Centre. There is even an Introduction to Rag Rugs, if your toes feel a bit chilly when you hop out of bed in the morning! After much anticipation, the sofa for my office has returned, and is looking very smart in its new livery of 100% wool Caledonia Peppermint from Kirkby Design. The upholsterers, Escott’s, a family-owned business and member of the Association of Master Upholsterers and Soft Furnishers, provided a very efficient, competitive and personal service. 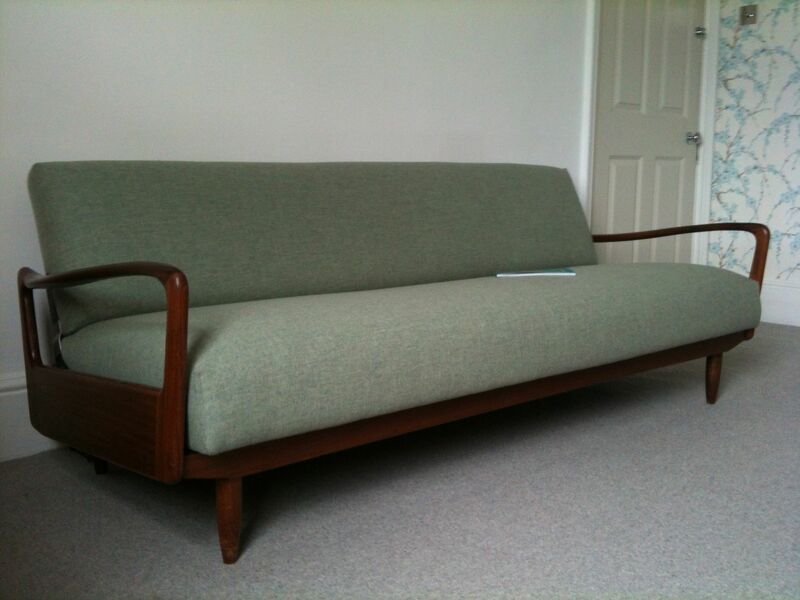 The sofa is just the colour we want, and I saved myself a third of the price of an identical sofa I saw in a mid-century shop! I think it will be a popular addition, my daughters climbed straight on to the sofa for a story, so time to find a suitable throw to spare the fabric from sticky fingers, and I think they would like a cushion or two too! To find an upholsterer in your area you can search the directory of members on the Association’s website or call them directly on 01494 452965. Inspired by my recent furniture painting course, I went in search of other courses to restore, recycle, renovate, reuse, and found The Goodlife Centre in south London, near Waterloo station. The Goodlife Centre offers practical workshops in DIY, decorating, woodwork, furniture restoration, upholstery and traditional handcrafts. The courses vary from evening workshops, day or weekend intensives or longer, such as the popular 4 week Basic DIY course. Prices start at £60 for a 2.5 hour workshop. You could even host a private party! So if you fancy getting your hands dirty learning a new skill, someone is about to set up home and create a personal touch on budget then check out their upcoming courses. I am spoilt for choice!